COMP Cams' new Ultra Pro Magnum Rocker Arms are engineering works of art. Just one look at the redesigned version of the very popular Pro Magnum line of rocker arms shows the ingenious thought process behind the rocker arms design. We wanted to go to school on these rocker arms and see what kind of report card they earn. Seeing is believing. At least thats what my art appreciation professor told my college class as we were required to look at a Picasso and describe what we saw. As I recall, most of my classmates saw something akin to a kindergarten finger painting as we gazed at that piece of art. Now, looking at Comp Cams new Ultra Pro Magnum Rocker Arms, I finally understand what true art appreciation means. Yes, seeing IS believing! Not only are these new rocker arms true works of art, but anyone can plainly see the advantage of their stellar design. Even stronger and lighter in weight than COMPs own best selling Pro Magnum Rocker Arms, this Ultra design earns an A+ in humanities. Reduced mass for increased retainer and spring clearances. Once upon a time there were only two choices in rocker arms; stainless steel, which tended to be used for applications where strength and reliability were needed, and aluminum, for lightweight and lower cost applications. Almost twenty years ago, COMP Cams released the uber popular Pro Magnum Rocker Arms which combined strength and reliability with lightweight low cost rocker arms made from 8650 chromemoly steel. Continuing computer advancements and superior design technology have led COMP Cams to restructure the already successful Pro Magnum rocker arms with a web-like structure adding even more strength and reducing even more mass. Dubbed the Ultra Pro Magnum Rocker Arms, COMP Cams has made another historic improvement in rocker arm design. We talked with Chris Mays at COMP Cams about taking a very successful rocker arm and redesigning it. "There's always the opportunity to make something better," Mays commented. "As technology changes and information changes, the opportunity to make parts stronger, more user friendly, and apply across a wider variety of applications presents itself." Another set of high marks for the academic scorecard. Through restructuring at the most basic liquid molten level, COMP Cams uses an advanced web-like structure to add strength in the rocker arms while allowing the engineers to reduce mass in low stress areas of the components. This results in maximum lift and valve train control at high RPM. Reducing mass also increases retainer and spring clearances allowing larger valve springs, retainers, and locks without fitment issues. Mays also told us that the new rocker arms "have truer ratios and the valve spring clearances reduce many issues with big block engines. Valve spring clearance with higher lift cams are always an issue in big block engines whether it's Chevy, Ford, or Mopar." Making the rocker arms "more user friendly" and capping it all off with a black oxide finish that inherently sheds oil for a more efficient valve train with even less mass earn high grades in this class. Ultra Pro Magnum Rocker Arms = A+ squared. A good looking piece that is refined with technical advances. Less weight and deflection from the fulcrum point to the roller tip. The new Ultra Pro Magnum Rocker Arms are made of 8650 chromemoly steel, which is 300% stronger than extruded 7075-T6 aluminum; it is the strongest of aluminum materials. Unlike aluminum rockers, the new Ultra Pro Magnum Rocker Arms offer rigidity for maximum lift, limited flex, and cycle strength that will last a lifetime with the added bonus of reduced deflection from the fulcrum point to the roller tip. As a result, Ultra Pro Magnum Rocker Arms weigh 5% less at the valve than most aluminum rocker arms. Less weight in the valve train means less load on the valve springs which in turn allows the engine to turn more rpm for more top end power. Putting your valve train on a diet without losing strength and reliability earns a 4.0 grade point average. COMP Cams goes to the head of the class with this rocker arm. The redesign of the Pro Magnum Rockers allows for a larger trunion with added needle bearings to spread the load more evenly which helps promote a longer lifespan of the component. The Ultra Pro Magnum Rocker Arms are also rebuildable, which means that they can be disassembled for inspection or for replacement of the roller tips, axle, or bearings making the rocker arm like new. Through normal use, these rocker arms will last more than a lifetime. COMP Cams even guarantees the rocker bodies for life against breakage. Buying one set that never has to be replaced is the best economic value going! 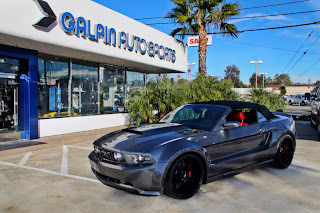 This entry was written by by Bobby Kbro (Stang TV Forums) and posted here on Monday, February 22nd, 2010 at 3:32 pm and is filed under Vintage Mustangs. This article was not written by us, rather gathered using RSS feeds listed here. We take no credit for this article. Both comments and pings are currently closed.